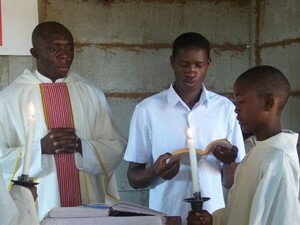 Father Pius Afiabor is an SMA priest from Nigeria. He is a member of the African District and has been serving in the Republic of South Africa since his ordination in 2002. He ministers in Rustenberg mainly to the Botswana people, but due to the many platinum mines in the surrounding areas, Fr. 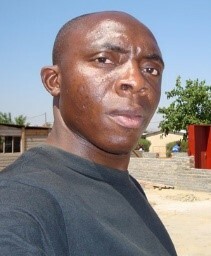 Pius also is met by immigrant mine workers from neighboring Namibia, Angola, Zimbabwe, and Lesotho. Amongst the many gifts that one finds in South Africans, the gift of singing remains outstanding. It’s almost natural as this comes rather spontaneously for them to sing whenever a song is started, be it during an informal gathering or even at demonstrations. The same goes during funerals and during the celebrations of the Holy Mass. Well-choreographed dance steps and moves usually accompany this singing, especially during processions. When asked about the importance of music in the life of the South African, an old parishioner simply responded, “That is what kept us going during the dark days of apartheid”. 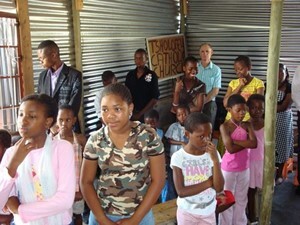 It is now almost fifteen years since the fall of apartheid and thanks be to God for all the positive changes thus far. The quality of singing still remains amazing and soul lifting. No matter the number of those gathered and irrespective of the occasion, one cannot help being moved by the lyrics and the tone of the singing. And so, one can say that singing remains one of the sure means by which the South African reality is best expressed. Suffice to say that the singing of the Gloria during Mass remains a true expression of the fact that we live to give glory to God as the voices unit to sing GLORIA IN EXCELSIS DEO. Indeed, the Eucharistic Celebration on Sundays, when well-prepared, could really be said to be a True Celebration of Life. Of course, this celebration does not in any way obliterate certain realities: In the same worshipping community are women and girls coming from homes where they have been or are still being abused both physically and emotionally. 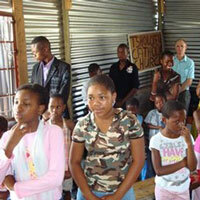 Young people in families have been torn apart by abject poverty and devastated by the scourge of HIV/AIDS. Also in the same worshipping congregation, we have immigrants from neighboring countries working under extremely tough conditions, especially in the mines, and living under appalling situations in their informal settlements. Suffice to add, that most still live under constant fear of xenophobic attacks. The sum of all this could lead to the temptation to conclude that there is a certain denial of reality by these people as they gather; a refusal to openly exhibit whatever frustrations and difficulties they may be going through. Be that as it may, in this apparent denial is the acknowledgement of something greater, LIFE. It is this sincere acknowledgement of this great gift that is being expressed in the celebration of Mass on Sundays, especially during Easter Vigil. A true Celebration of Life. After all that is what the Eucharist is all about; EUCHARISTIA, which means THANKSGIVING, a celebration of thanksgiving for the gift of Life. In order that this celebration of life could truly have a lasting positive impact on our people, we constantly try to educate them on the sacredness of life and also challenge them to shun whatever actions disrespect the dignity of the human person. That it is our faith that brings us together and our togetherness should motivate our actions against all that thwarts our path to finding true happiness and fulfillment in life. After all, according to St Ireneus of Lyons, The Glory of God is for us humans to be truly and fully alive. May our Sunday celebration of life help us to find true peace and lasting joy in this life and in the life to come. AMEN. ← Statement by Bishop Dennis Kofi Agbenyadzi, S.M.A.